I enjoy trying new places to eat. Not just because I’m fortunate enough to write about my experiences and share them with other interested local foodies, but also because there is something exciting about discovering a great new restaurant. Trying things I would not typically order but must because it’s a popular menu item, has enhanced my love of food and deepened my appreciation for the chefs that create them. Rye is one of those great discoveries. 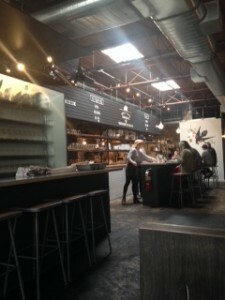 With a feel of an urban diner, the clean and deliberate freshness of the interior reminded me of a big city haunt only the locals know about. Since I went at an early lunch hour, I felt it only appropriate to try both a breakfast menu item and a few of their best-selling lunch entrees. I’m sure glad I did. My friendly and eager server, Clark, made some recommendations based on the restaurants best sellers. 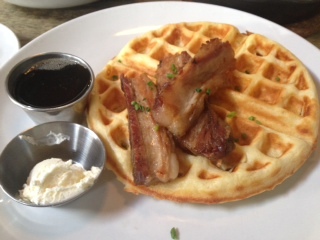 First up was the Waffle & Whiskey ($9) and I added pork belly ($4). The salty, sweet mixture is always a favorite of mine and this combo took it up a level. The Belgium-style waffle was the perfect density and soaked up the whiskey syrup with ease. The added flavor of the tender pork belly was a delicious addition to each bite. Honestly, I did not want it end. From there I moved on to the Heirloom Carrot Salad ($11). 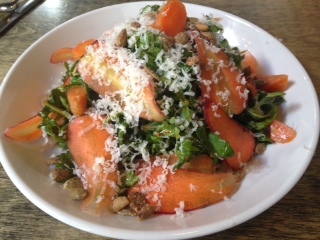 The bed of spicy arugula was the perfect host to these delicious, sweet and colorful shaved carrots. The mixture was tossed in a savory Moroccan dressing and topped with toasted pepitas and shaved manchego cheese. Simply delightful and refreshing. 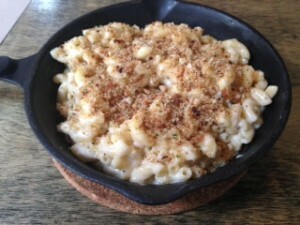 My final entrée was the very popular Truffle Mac & Cheese ($8). Served in a warm cast-iron skillet, the flavors are perfectly blended creating a creamy and richly flavorful spin on a classic dish. This is a dish I now crave. The dinner menu seemed very promising as well. Street Dumplings and the Shoyu Fried Chicken ($10-$15) are tops on my list to try. There are also several vegan, vegetarian and gluten-free options on the menu. 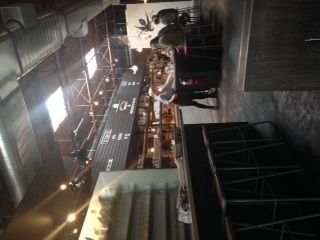 Chef Tommy Nguyen, formally of Takashi, is on to something here. His seasonal menu utilizes all things local. Think diner food with an Asian fusion. Fresh pastries are made daily by Pastry Chef, Alicia Pacheco and although I did not have the room to try them, I saw a few pass by me and let me just say, the apple pie was calling my name. Rye is located right next to the Urban Lounge and what better way to embrace your nightlife neighbors than to collaborate with them. Rye has a late night dinner and drink menu for those night owls and turns on the entertainment happening next door on television screens set up around the restaurant. No matter what time of day you happen to stroll in, Rye has something tasty in store for you. “From the early birds to the night owls,” to quote their tagline, Rye is where it’s at.